If you are serious about grilling, then you need to take good care of your barbecue grill. It’s the central piece that makes all of those delicious meals possible and the level of care that you show the grill can directly affect the way in which it operates and the quality of the food that comes off the grill. It doesn’t matter whether you cook over charcoal or if you use gas, learning how to clean a grill is one of the fundamentals of producing the best barbecue. The first and most important rule of grill care and cleaning is to clean the grill after every use. You will still have to perform the more thorough annual cleanings, but the regular cleaning after every use will keep the grill in good shape, and it will make the annual maintenance easier. Giving the grill enough time to cool down a little, but while it is still warm, you should scrub the grates with a wire brush and remove any large bits of food that have caked on. In addition to this, you will also want to wipe down the exterior and clean any burners or side components of the grill. If you are using a charcoal grill, you will also want to empty the ashes and debris from inside the grill. As mentioned in the section above, you are going to want to clean the grill grates after every use, but you will also want to do an annual cleaning of the grill that includes a full cleaning of the grates. If you have kept up on the cleanings after each use, then this deeper cleaning of the grates should be easier. For giving the grill grates a thorough cleaning, you have a few options. For most people, the best way to go is to remove the grates from the grill and let them soak in soapy water for a few hours. Then once they have soaked, you can scrub them down, and they should come nice and clean. Rinse off all of the soap, return them to the grill and the job is done. If the grates are especially dirty, with caked on grease and grime, then you may want to use oven cleaner. Either way, you want to rinse the grates down with water when you are done to make sure that any soaps or cleaning agents have been completely removed. For the regular cleaning of your grill grates, there is a green alternative that may appeal to a variety of grillers. While the grill is still hot, the user can take a halved onion and rub it flat side down on the grill. This will effectively remove much of the caked-on grime, and it does the job without the need of harsh chemicals. This method is low cost, it is environmentally friendly, and it also works for the intended purpose. When you go to perform the annual cleaning on a gas grill, there are a series of points that you are going to want to make sure that you cover. 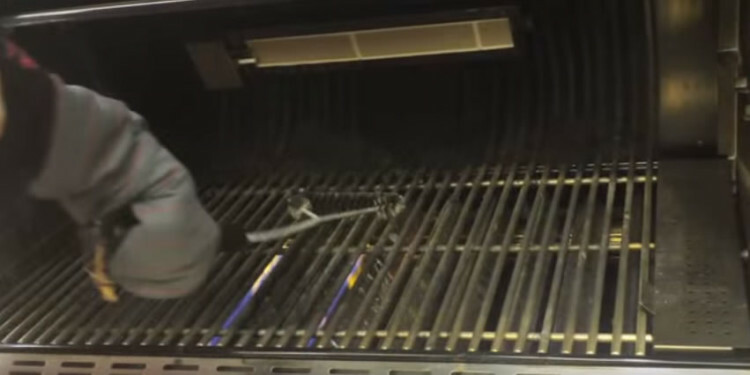 With cleaning a gas grill, the first step should be closing the gas valve and disconnecting the tank from the unit. Once you have the gas disconnected, you can then take the unit apart piece by piece to inspect and clean the different parts. As with any grill, you will want to give the grates a thorough cleaning, and you will also need to clean the exterior of the grill. Remove the covers for the burners and scrub them clean. You can soak them in soapy water with the grates to make them easier to clean, but if they are especially dirty, then you may need to use a scouring pad. Once again, you will want to rinse this part down with water before returning it to the grill. While the covers are off the burners, you will also want to make sure they are clean and in good working order. Inspect the burners to see if there are any clogs or obstructions that could impact the operation of the grill. If the burners are in good shape, then you can wipe them down with a sponge or cloth. Clean the interior of the grill using some soapy water and a sponge. Give the interior a good scrubbing to remove all of the grease and food debris that builds up over time. Once you have scrubbed the interior clean, you can then rinse it out with water to remove any leftover soap and replace all of the parts that were removed during the earlier parts of the cleaning process. 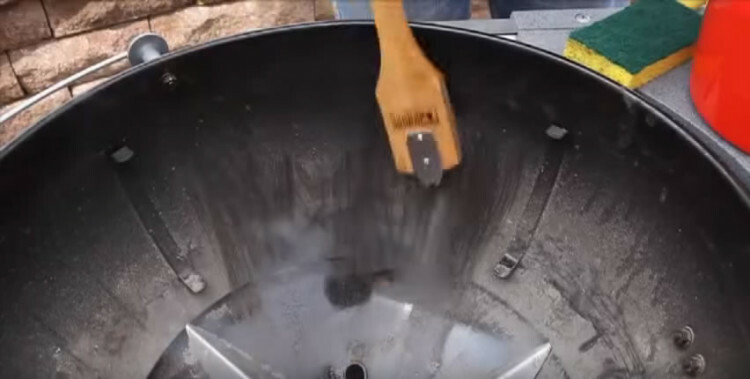 Many of the steps for cleaning a charcoal grill will be the same as with a gas grill. The cleaning of the grates and the washing of the interior and the exterior are all steps that will need to be performed regardless of the type of grill that you own. 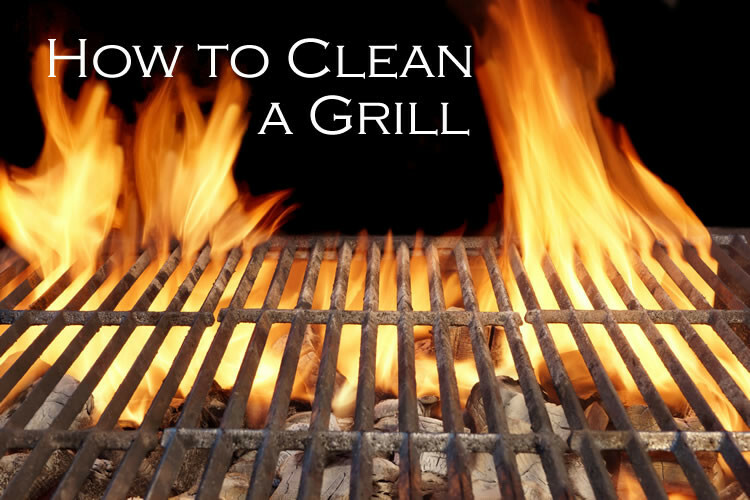 To perform the annual cleaning, remove all of the parts from the body of the grill. Soak the grates with the ash catcher and any other removable metal parts. Give the exterior of the grill a good wipe down with some soap and water and wash the interior with the same. Once you have the body of the grill scrubbed and cleaned, rinse it all down with some water. You can then go to the parts that are soaking and give them a good scrubbing. Once all of the parts are cleaned, you can then replace them in the grill and just wait for everything to dry before you start to cook. Just as with the other two types of grills, an infrared grill is going to have many of the same steps for cleaning. You will remove the parts from the grill and clean them one by one. Soak the grates just as you would with any other grill. Wipe down the exterior and the interior to keep the body of the grill in good shape. All of these basic steps are pretty much the same as they would be with a gas or charcoal grill. The only step that is different with these models is that you will need to remove and clean the heating element and the heating surface. You won’t want to use any harsh cleansers on either of these parts, but instead, wipe them down with the soap and water that you use on the body of the grill. Additionally, you will also want to make sure to rinse these parts with water when you are done. As a final option, there are services that offer professional cleaning for barbecue grills. These services will clean the grill from top to bottom and get every part as clean as it possibly can be. Along with that, most of them also do grill maintenance, so they can also inspect the unit to make sure that all of the parts are working properly. These professionals will take the grill apart and clean it in ways that go well beyond that of the average grill user. It’s a good option, but it will cost you more than doing the job yourself. Whether you do it yourself or hire a professional, grill cleaning is a necessary step for cooking good food and for safe grill use. Perform the regular cleaning after every use and give the unit an annual overhaul and your grill will serve you and your family well for years. If you have a grill, its a must to think about cleaning it, because if not you are putting the life of your family and friends in danger. I think this information is a must read to everyone.